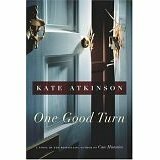 I guess one reason I didn't connect with the Rebus novel (by Ian Rankin) that I was reading last week was that I was simultaneously (and coincidentally) reading another novel about Edinburgh, Kate Atkinson's One Good Turn, a sequel of sorts to her earlier Case Histories. One Good Turn is an amalgam of a literary novel and a crime novel--there are repeated references to Matryoshka dolls in the book, setting up the notion that the intertwined stories in the book are nested like the dolls. But in fact, the plot is more like a snake eating its tail, a looping of twined narratives whose interrelationships only become obvious at the very end. It's as if a bunch of characters from literary and popular novels (Maeve Binchy comes to mind, or maybe Alice McDermott) find themselves plopped down in Edinburgh amid a series of violent acts growing from the road rage incident at the beginning of the book. With a good crime novel (or a good novel) there can be a sense of elation at the end, an emotional release with the completion of the circle or the resolution of the story. Though Atkinson doesn't quite wrap everything up in a neat package, she does deliver that kind of literary satisfaction--without stenting on the crime story, the noir elements, or the considerable humor with which her story is laced. One Good Turn is a big step forward from Case Histories: more complex, more coherent (once you get to the end of the book), and more satisfying--plus the humor is more overt, inducing not just smiles but laughter. And One Good Turn is also a step up from the average crime novel (without condescending to the genre). Atkinson shows us why reading about crime is so enjoyable: we're reading about ourselves at our limits--the limit reached when our actions and desires are taken to their ultimate conclusions.